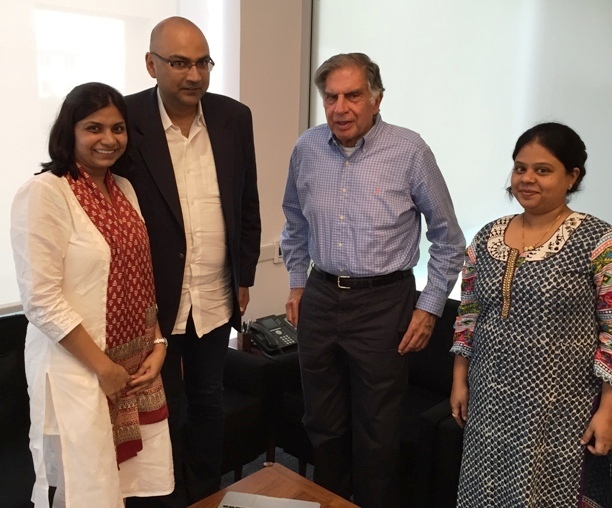 Home > News - May 2016 > Ratan Tata Invests in Medical Emergency Response Start-Up Company MUrgency Inc.
Ratan Tata Invests in Medical Emergency Response Start-Up Company MUrgency Inc.
Ratan Tata, Chairman Emeritus of Tata Sons, has invested in the San Francisco based medical emergency response start-up app company, MUrgency Inc., developing ONE GLOBAL EMERGENCY RESPONSE NETWORK. The international award winning mobile app makes emergency response available with just one tap on a mobile phone in under 9.0 minutes in urban areas. MUrgency Inc. will use the proceeds of the funding to augment technology and scale operations besides leveraging Tata’s experience and network as a global business leader to develop the emergency response network globally through appropriate partnerships. Ratan Tata has made more than 25 investments in startups in the last two years. Healthcare startups that have benefitted from his investment include Lybrate, an online doctor consulting start-up, Swasth India, a startup which focusses on cancer treatment and health data analytics and Invictus Oncology, a cancer therapeutic startup. Founded in 2014 by Indian Social Entrepreneur Shaffi Mather in Silicon Valley and incubated out of Stanford ChangeLabs, MUrgency Inc. recently received investment from Kris Gopalakrishnan and S. D. Shibulal led Axilor Ventures. MUrgency launched their service in the TriCity area in Punjab, India on 16 February, 2016 with a a responder network of 36 hospital emergency rooms, 40+ ambulances and 350+ medical professionals. MUrgency is slated to launch service in Amritsar and Jalandhar in the last week of May, 2016 and cover entire state of Punjab by end June, 2016. The company plans to make its services available across India by 2018 and around the world by 2020. MUrgency recently won two of the most prestigious startup tech competitions in the US – Startup of the Year at Startup Grind 2016, Redwood City and First Prize in Health & Wearables at SXSW Festival, Austin. “Tata’s involvement is an affirmation of the importance of a reliable emergency medical response network for the world and of course India to save lives which are otherwise lost for want of timely medical attention. He clearly wanted us to launch and grow the network in India first before taking it overseas. Mr. Tata’s investment in MUrgency will help attract leading talent to the company and major partnerships beyond India.” said Shaffi Mather, Founder, MUrgency Inc.
Apart from MUrgency, Tata’s investment in overseas companies include among others, Boston-based wind energy startup Altaeros Energies, China’s largest smartphone maker Xiaomi and Singapore-based startup Crayon Data, a big data analytics firm. Shaffi and Sweta along with three of their friends founded ZHL with one ambulance in 2004 and led the company to become the largest emergency ambulance service company in the developing world with operations in 17 states in India and the Gulf (Middle East). ZHL has grown to 1500+ ambulances and 6000+ employees transporting between 8000 and 10000 patients every day. Till date, ZHL has transported over 5.20 million+ patients and delivered 10000+ babies on board. MUrgency Inc. was founded by Shaffi Mather in 2014 to establish MUrgency – ONE GLOBAL EMERGENCY RESPONSE NETWORK to make reliable emergency medical response available to anyone, anytime, anywhere in the world at the tap of one’s mobile phone. The MUrgency app was developed with membership in BCtA @ UNDP (Business Call to Action at the United Nations Development Program), in academic partnership with Stanford ChangeLabs, Harvard Asia Center and MIT Global Health and as a Young Global Leader Initiative of the World Economic Forum.